Former City Council Candidate, Robert Bates, is continuing his battle to have an outside investigation done on the Cedar Rapids Police Department. He made a Youtube video of a phone call he made to the New York Associated Press on May 3, 2013 that became available to the public on May 5, 2013. Fifteen years after he stumbled upon a memorandum with his name on it claiming he was violent and under a doctors care Robert Bates has made it his life mission to have an outside investigation done on the Cedar Rapids Police Department. Robert Bates Robert Bates was charged with two felony counts of threats and an aggravated misdemeanor of first-degree harassment in 2009. He paid a $10,000 surety bond to get out of jail.Trish Mehaffey a journalist with the Gazette covered this case in 2011. 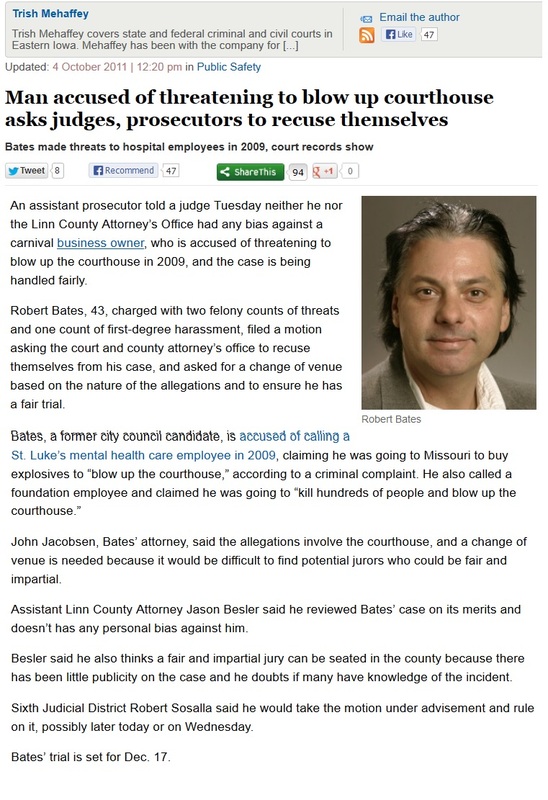 Mehaffy wrote three articles in 2011 about Robert Bates but never once called him to ask him his side of the story. 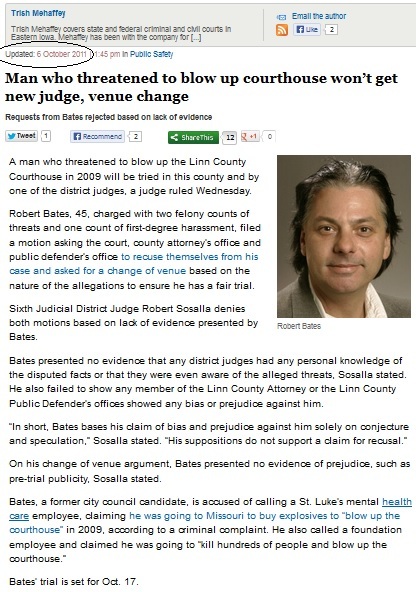 News reports aired over and over reminding everyone that “Robert Bates, 43, was charged with two felony counts of threats and one count of first-degree harassment.” Saying “he threatened to blow up the courthouse”. I asked Bates if he’d ever been interviewed by Trish Mehaffey from the Gazette. He said “no, I’ve been trying to tell my side of the story but they won’t report it”. handled fairly.” Robert Bates asked for a change of venue based on the nature of the allegations to ensure he had a chance at a fair trial and he was denied. would have been a potential victim therefore it would be a conflict of interest. “I didn’t get a fair trial because the case didn’t even go to court”. Bates said. I asked him if he was relieved the charges were dropped and he told me “no I wanted my day in court to settle this matter once and for all but the case was dismissed”. Mehaffy never mentions what this so called medical condition is. Bates says “it’s because it doesn’t exist”.